"Tender, delicious chicken every time. Serve over buttered orzo with a fresh green salad on the side. The fresh basil is the icing on the cake!" Whisk egg and milk together in a bowl. Place bread crumbs in a separate bowl. 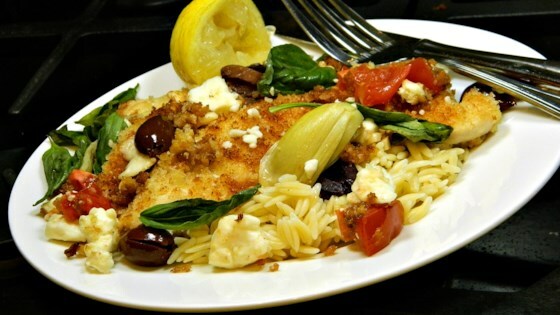 Soak chicken breasts in the egg wash and coat with bread crumbs; place on a plate. Preheat oven to 350 degrees F (175 degrees C). Coat a baking pan with cooking spray. Heat olive oil in a skillet over medium heat. Fry chicken until browned, about 3 minutes per side. Transfer chicken to the prepared baking pan and sprinkle with lemon juice. Cook garlic in the hot skillet until fragrant, no longer than 30 seconds. Pour in white wine and scrape the bottom of the skillet. Add tomatoes, artichoke hearts, and olives. Cook and stir until heated through, about 3 minutes. Add basil; cook until wilted, about 3 minutes more. Pour artichoke mixture over chicken in baking pan and top with feta cheese. Pour chicken broth over everything and cover the pan with aluminum foil. Bake in the preheated oven until chicken is no longer pink in the center and the juices run clear, about 30 minutes. An instant-read thermometer inserted into the center should read at least 165 degrees F (74 degrees C). Everyone in my familY really liked it. I am definitely going to cook it again! Very tasty. I would recommend using a two quart casserole dish. Easy to make and very good, tasted even better the next day.